Casa Panama's spectacular setting is overlooking the Russian River Estuary and Pacific Ocean with breathtaking views and sunny living areas. This well-appointed property is surrounded by thousands of acres of parkland and open space. A haven for restorative retreats, reunions and family gatherings, and for the activity minded, there is bird watching, hiking, biking and kayaking at your doorstep. Casa Panama's designer kitchen, eclectic furnishings, and fine art collection create a unique and restful retreat. Enjoy a sunny private deck just outside the living/ dining rooms for a sun-drenched meal. From this vantage point, you will have incredible views from morning until sunset of the river to the coast! The state of the art kitchen has all new appliances: large gas stove and oven, family-size refrigerator, two stainless prep sinks, microwave, toaster, blender, coffee maker, gourmet cooking supplies, 2 sets of coordinated dishes, glassware, and table linens. Then just outside the downstairs door find a versatile outdoor living space that includes several seating areas with a gas grill big enough to serve your entire gathering with ease. Use the kitchenette pass-through window for convenient serving and cleanup. Enjoy the new undercover bar on that same patio for coffee or wine tasting. Casa Panama is located along scenic Hwy 1, ten miles north of Bodega Bay and twelve miles west of Guerneville or 30 miles from Santa Rosa. Enjoy access to California's most picturesque beaches, the Russian River, redwoods, parkland and Sonoma Counties most renowned wineries. See Casa Panama.net page for additional pictures if needed. The downstairs floor of Casa Panama is called Casatina ( listing number 904724) and can be rented only when Casa Panama is not rented. The dates it is available are seen as tentative (in yellow) when available. If you are interested in renting Casa Panama any of those dates ask that they be released. Casatina sleeps 2-4. Casatina has its own garden entrance, living room with kitchenette, bath and bedroom with spectacular river and coastal views with a warm inviting ambiance. You will have access to all the same outdoor spaces, decks and hot tub. I am a decorator at heart and a retired decorator by profession. It is with great pleasure that I continue finding ways to make your stay more comfortable. I live nearby but there is always a caretaker available if you have any problems or need any help. We rent Casa Panama in various combinations of accommodations at certain times of the year. Every day we spend at Casa Panama is like a little heaven on earth and I hope you find the same true for you! I am originally from San Diego daughter of a well-known fashion professional of the same name and a Dutch father, a cabinet maker who built not only all the furniture but also designed and built our home on a ranch in the country. All of the famous designers visited the ranch for sophisticated parties and events while on the flip side my sister and brother and I might have been out picking oranges, tending the animals or riding our horses. I have always loved the ocean and have fond childhood memories of daddy taking us out in the San Diego Bay for fishing trips on his cabin cruiser. I have lived on or near the sea for the past 40 years with a memorable stint in the Caribbean for 12 of those years. When I moved to the Northern California area, I just fell in love with Jenner at first sight. The people and the place just resonates a vibe you will never forget. The history of the Jenner area is best told by our local historian Elinor Twohy. For my part I know that the sister of Josephine Santos Wright married and built what is now Casa Panama with her husband in 1950. History of the Jenner Area by Elinor Twohy We know that Pomo Indians had been living here for 3,000 years; however archaeologists have recently uncovered significant evidence in the middle of Duncan's Landing which may prove that Pomos were here for 10,000 years. 'Pomo' is an overall name covering six language groups and several different tribes. The local tribe, know as the Del Rio Indians, was friendly with their neighbors from around Bodega Bay, the Miwoks. From a study of the middens, we believe that they had ceremonial gatherings at Duncan's Landing. In the 1920's the two Penny brothers owned & lived on the twenty-nine acre island that is in the middle of the river, directly in front of the town of Jenner. One brother was drowned in an accident at sea. When the other brother became ill, he wished to live the rest of his life on the island & to be buried there. Joe Santos had come from Guam, married a local Pomo woman, built a house near the river mouth on Goat Rock Beach, & started a family. Joe agreed to carry out Penny's wishes, & in return the island was deeded to him. Joe then built a house on the island, where the Santos family grew fruits & vegetables, raised dairy cattle, & sold their produce to townsfolk of Jenner and Monte Rio. The Santos family lived on Penny Island until 1948. One daughter, Josephine Santos Wright, born in 1904 in the original house on Goat Rock beach, still resides in Jenner & provides us with authentic historical information. In 1975 the island was finally acquired by the State of California Department of Parks & Recreation. It has become a sanctuary for animals and birds; recent sightings include foxes, a bob cat, a mink, great horned & barn owls, & both white & brown pelicans. Jenner is located in the center of thousands and thousands of protected open space next to a coastline lined with parks lining the coastline from north to south. The Jenner Headlands is one of these parks of 5400 acres and is located directly above the house! You can take a short walk up Willig to enter the residents gate to hike the 14 acres of new trail just recently opened. Or, at Willow Creek you can ask for advance permission to mountain bike or just walk the trails there all the way to the coast ending at Shell Beach. Kayaking rentals are just a 3 minute walk down the hill for discovering the River estuary or just traversing over to a day at the beach. Watch the seals, the whales, the birds etc. and discover one of the most famous beaches on the North Coast, Goat Rock Beach with its unique vantage points views and trails. From there walk north or south as far as you like! I fell in love with this property at first sight. The moment I walked in the view just took my breath away. I bought the house from the original owners who were directly related to the areas Native American band of Pomo Indians. The house was hand crafted in 1950 of regional old growth redwoods. The property was carefully selected to get the best of the sun all year around and the best view Jenner had to offer and of Penny Island family home. Now days we are in the heart of an eco system surrounded by thousands of acres of open space, state parks, beaches, red wood forests, coastal prairies, hiking trails, biking routes and water trails yet only 30 minutes from Santa Rosa and an hour and a half to San Francisco. If you do plan to drive to San Francisco do it at a more leisurely pace through Bodega Bay or Occidental, Freestone, Tomales, Point Reyes, Fairfax and San Anselmo. Enjoy our little towns, vistas, fresh air and coastal views. Relax and stay awhile! Casa Panama is minutes from the ocean at Goat Rock & all the many parks & trails along the coast. Traveling north or south is a must to explore & see on of the most beautiful coastlines in the state. Jenner is considered a rural area with wonderful opportunities for Eco-tourism; hiking, biking, kayaking, horse back riding & wind & water sports yet you are only 30-45 minutes from Santa Rosa. The town of Jenner is like a village to those who live here. We are proud to have a post office, coffee & gift shop, kayak rentals, community center, world class restaurant, hotel & visitors center. Jenner is located at the mouth of the Russian River where the river meets the sea. Walk 3 minutes down to the river and rent kayaks for exploring the river or taking a short cut over to the beach! Expansive river, estuary & ocean views. Casa Panama is known for having the best views in Jenner. Casa Panama is just below the Jenner Headlands and across from the Goat Rock State Park. You will enjoy the views of the green hills in the distance. Relax watching the birds glide over the rivers end & then witness the most beautiful sunsets ever. The views extend from the river on one side to the ocean on the other. You will enjoy the view from morning till night as you watch the light change with the weather. There is a nice gas chiminea on the lower deck between to warm yourself between the two big outside sofas. It does a great job but be careful because it can be hot to the touch. A satalite system, the best available on the coast which works well for everything but large downloads. Watch the river where it meets the sea from the dining table which seats 10 comfortably until the sun sets before you! The views are incredible! Just outside is another table with seating for 4-6. A large supply of books are in the bedroom upstairs. The garden is naturally lush with most plants indigenous to the area. the vegetation is a protected haven for the many birds of the area. There is a balcony just off the dining room that is a lovely sunny spot for breakfast or evening meals. The views are both of the river & the coast which makes this a good spot for sunset as well. Don't miss the opportunity to experience the most beautiful part of the Russian River by kayak or canoe. Rent from WaterTreks just down the hill or bring your own & launch from the visitor Center. Bring your bikes to this community surrounded with bike trail's & adjacent to Levi's celebrated 'Gran Fondo Ride' route from Santa Rosa through Cazadero to Hwy 1 past Jenner to Occidental & back. Bring your own small boat with quiet engine and use the launch at the visitor center just down the hill. This is a really unique opportunity to experience this area of the Russian River estuary. Just outside the door downstairs is a covered porch and a bar with decks and places to sit at small tables that’s warm and sunny with beautiful views. There is a 3 deck outdoor entertainment area. A covered wine or coffee bar adjacent to cozy dining areas & the gas grill with a lower area for comfortable lounging or sunbathing next to the hot tub. Most gear can be rented at WaterTreks (707) 865-2249 from Suki or from Lotus Kayak both in Jenner. The hot tub is a not to miss opportunity! Find it in a new more convenient place just steps away from the back door with a full view of the river. This property is fully equipped with most everything you will need. There are plenty of seating options throughout the property for entertaining & glassware & dish options to help you entertain with a flair! Ask about our favorite caterer who will come to your kitchen and prepare any meals you wish. With such wonderful views from the kitchen you won't be cooking alone no matter what! And, with the variety of BBQ's outdoor cooking is just as social. There are quiet seating areas in little corners around the decks inclusding outdoor chairs & tables to seat up to 14 comfortably & there are two large wicker sofa's with comfy cushions with a gas fireplace between them on the large deck. The hot tub is where you want to be for sunset if you can get away from the dining room table on time! This house is best know for it's use as a place to get together with your family and friends. We have just made new changes and you can now rent the house using any number of bedrooms you wish. This is a beautiful home with lots of character. The views were amazing from the multiple decks. Beds were comfortable and living space was perfect for our large group to enjoy. Bathrooms were small, but they had everything we needed. I would definitely go back again! Casa Panama has everything you need or want for a wonderful stay in Jenner: excellent location, breathtaking views, well appointed rooms and excellent kitchen. Eight of us stayed over the Christmas holiday and enjoyed ourselves very much. The casita downstairs was perfect for the teenagers. The house has beautiful artwork as well. gorgeous, well appointed and super clean! We had a fantastic time at Casa Panama. Lots of attention to detail. Everything was really lovely. The place had everything we needed.The beds were great.The view was fantastic! Our host Teri was really helpful as well. Counting the weeks til we can go back again! Thank you! Our reunion of friends was everything we hoped for and more. The photos and previous reviews had clued us in, but Casa Panama still exceeded our expectations. The owners practically had to pry me off the deck to get me to leave. Gorgeous weather may have helped, but the views are mesmerizing. The kitchen is well outfitted to make dining in a pleasure. The beds are very comfortable. Lots of conversation areas, both inside and out, make for great socializing. Loads of hiking opportunities nearby. Casa panama is a great home! Very well appointment with lots of beautiful art. We had 10 people and were very comfortable. The decks offer beautiful views. We loved it and would definitely stay here again!! This house was fabulous! My family consists of 8 adults and a 7 month old baby. We had more than enough space inside and out to hang out and relax! The views from the patio are spectacular and must be the gem of Jenner! The beds were all very comfortable and the house had everything we needed! The separate downstairs with a bedroom, kitchen and living room was perfect for my daughter, her husband and baby! Communicating with Toni before our arrival was also very helpful. We would definitely stay here again! Explore California's most scenic coastline & beaches. Watch sea lions play in the surf, canoe or kayak the Russian River or the river mouth to the sea! Surf the famous Goat Rock curl or try Salmon Creek Beach. 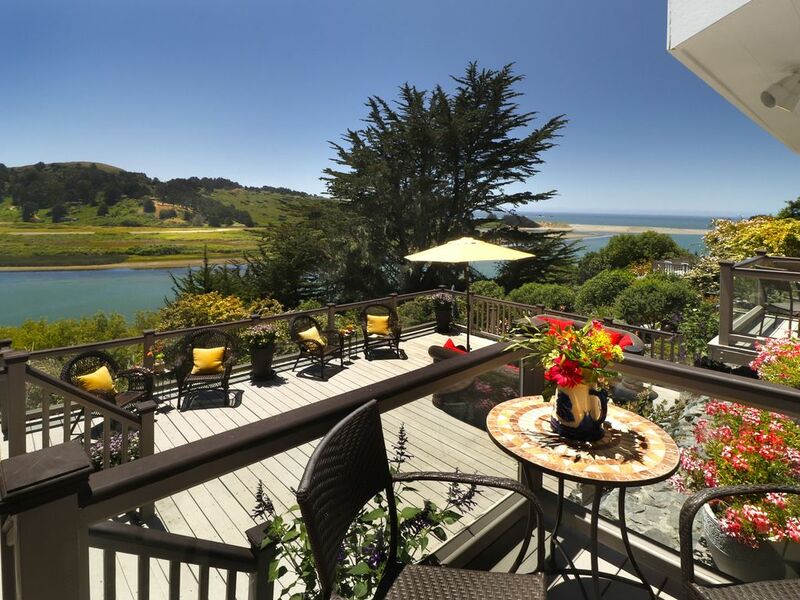 Experience nearby sport fishing, golfing, sail boarding, hang gliding, whale watching and horseback riding 5-15 minutes away south bound towards Bodega Bay. Try a top rated McKenzie designed 9-hole golf course, zip lining and wine tasting at hundreds of Sonoma County wineries 15-30 minutes away westbound. Or drive north to Fort Ross, Gualala and Mendocino! Unique shopping areas for antiques, art galleries and crafts, gourmet dining, theaters, live entertainment and book stores in nearby Duncans Mills or Guerneville. For bicycle riders find yourself in the midst of the most favored Amgen and Levi’s Grand Fondo routes. And, don’t miss our local coffee shop for freshly made pastries or lunch and then try one of the best known restaurants in Sonoma County for fine cuisine and spectacular sunsets, both within walking distance! We will provide you with all the information you need to suit your personal interests and tastes because we really take pride in providing for your enjoyment.